Something was terribly wrong with the city of Bar in central Ukraine. Instead of spending days and nights in yeshiva, the youth now trifled their time in the streets, sneering at religion. They embraced every opportunity to ridicule Chassidic rabbis and their simple faith, but Rabbi Zusha of Anipoli, who journeyed from town to town looking for Jewish souls he could help, bore the brunt of their scorn, enduring malice every time he visited the city. Rabbi Zusha secured his few worldly possessions on the wagon’s bed and climbed into the passenger seat. 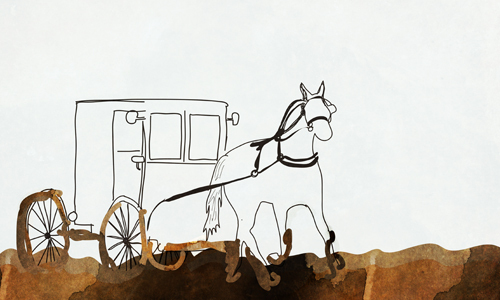 Before the driver could direct the horses forward, Rabbi Zusha held out a few kopeks. The wagon began to move, and before long the rhythmic swaying lulled Rabbi Zusha to sleep. As the town of Bar appeared on the horizon beneath the darkening sky, a carriage sidled close to the wagon and Rabbi Moshe of Pshevorsk—a renowned scribe and a student of Rabbi Zusha’s brother, Rabbi Elimelech—poked his head out from one of its windows. The wagon driver slowed to a stop. “Who’s riding with you?” Rabbi Moshe asked, motioning to the sleeping bundle. Rabbi Moshe signaled to his driver and they rode off. The carriage’s rattling slowly faded, leaving the wagon driver quietly weighing his options. Should he obey Rabbi Zusha or Rabbi Moshe? He picked up the reins and urged the old horse into action, heading directly towards Bar. Circumventing the town would make the journey much longer, and besides, the wagon driver had Rabbi Moshe’s assurance that nothing would happen to them. As the horse slowed, Rabbi Zusha awoke, sat up, looked around at the familiar streets, and realized where he was. But it was too late. The sun had already dipped beyond the horizon and Rabbi Zusha was particular not to travel at night. Seeing no alternative, he requested a room at an out-of-the-way inn, selected specifically so that no one would learn of his presence. But every inn was full and he was left with no choice but to ask his wagon driver to take him to the community hostel, the hekdesh, where all travelers were welcome to rest free of charge. Quietly, he spread his bedding in a corner and turned his face towards the wall. Word of his presence soon spread and a crowd gathered around the sleeping rabbi. Cheering noisily, they began playing cards, peppering their conversations with inventive profanities. The ruffians glanced over at Rabbi Zusha frequently, waiting to see how he would react to their provocation. Hardly believing their ears, the young men lowered their cards and watched the old man in the corner. Rabbi Zusha was still going at it, listing sins they themselves had committed as though reading them off a piece of paper. Rabbi Zusha’s words had their desired effect. The young men dropped their cards and covered their faces, deeply ashamed. Some sobbed while others were stunned into silence. After some time the erstwhile tormenters approached Rabbi Zusha with a collective request for help. Rabbi Zusha saw their honest expressions and downcast eyes and created a personalized path of repentance for each one. By morning, word of the night’s wondrous events had spread through the town, and everyone else wanted to ask the saintly visitor to help them too. Many, however, were ashamed to approach him, fearing he would see their sordid secrets. This was Rabbi Moshe’s cue. He had arrived in Bar to greet Rabbi Zusha and couldn’t help but beam delightedly when he found a sizeable group of desperate young people wanting to repent. Rabbi Moshe explained the situation to Rabbi Zusha, who approached each one individually and helped them amend their wayward behavior. From that time forward, Rabbi Zusha was never again bothered in Bar. On the contrary, whenever he passed through the city, he was greeted warmly and exuberantly, and kept busy advising and encouraging the now good-hearted townsfolk. I'd like to add another story about the saintly Rabbi Zusha. He was traveling around the province to raise money to ransom Jewish prisoners and stayed at a local inn. He was awakened before dawn by the sound of the chirping of many birds. He found them in the next room, hanging in crowded cages. R., Zusha said to himself, "Here you are, Zusha, traveling around to raise money to liberate prisoners and in the very next room, there are prisoners in cages!" R. Zusha opened all the cages and the birds flew out an open window. Shortly after, the innkeeper came by, saw the empty cages and began to beat the rabbi. Then he picked him up by the scruf of the neck and threw him out the door. Rabbi Zusha fell to the ground, then picked himself up and went on his way to facilitate the liberation of human prisoners.